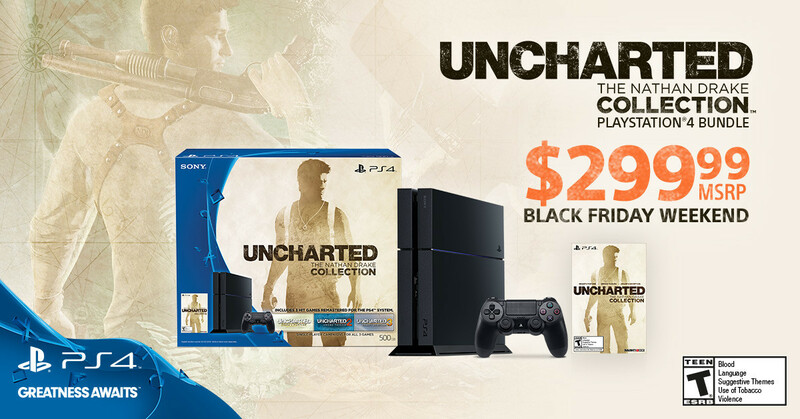 Sony joins Microsoft and discounts the PS4 to $299 for Black Friday, so where's Nintendo? Sony joins Microsoft and discounts the PS4 to $299 for Black Friday, so where’s Nintendo? Black Friday is coming up, so naturally the console wars are heating up again. Microsoft started with a $50 price drop on all of its Xbox bundles last week, bringing down its cheapest bundles to just $299 dollars for Black Friday weekend. That’s the most affordable the Xbox has ever been, and now Sony is following suit with a $50 price drop of its own. A bundle featuring 500GB of storage and ‘Uncharted: The Nathan Drake Collection’ will be available for $299, which is also the lowest the PlayStation 4 has ever been. As with Microsoft, Sony says the deal is exclusive to Black Friday Weekend, and will run from Thursday November 26 until Monday November 30. Although Black Friday videogame deals are common, the PS4 price drop is a little surprising, as Sony gave the console its first price drop ever just last month, with the console starting at $349 (the Xbox One received the same price drop in June). Still, Sony likely didn’t want to go into the holiday with Microsoft having an advantage – particularly given Microsoft just outsold Sony for the first time this generation – hence the new discount. That begs the question: what is Nintendo going to do? The console still costs the same exact $299 it did when it launched in late 2012, and that was a full year before the Xbox One and PS4 were even released. That has not turned out well for the Wii U, which features much less powerful hardware than its competitors and a smaller collection of titles. Despite a fancy controller with unique gameplay mechanics and high-quality exclusives like Super Smash Bros and Super Mario 3D Land, it simply has not been able to come anywhere near the success of its predecessor. Things have been so dire for the company, it’s even started to make mobile games. There’s never been a better time to drop the Wii U’s price to $250 or lower, and any discounts should remain permanent. That could at least tide the company over until the NX comes around.